Not content with festooning their pedals with some of the coolest-lookin’ graphic designs in guitardom (you know its gonna be a good day when you get to start it with the word festooning), Pro Tone Pedals is releasing a line of premium overdrives with a restrained, downright classy look. Visually the new Gold Label Overdrive is a world away from the psychedelic looks of the Jason Becker Distortion or the Raven Dirty Chorus. As for sonically? Well check out the description below! 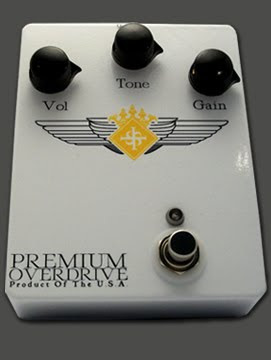 Pro Tone Pedals is proud to offer the Gold Label Overdrive, the first in the Premium Overdrive line. The Gold Label Overdrives 18 volt circuit was designed to deliver lush overdrive with the head room to provide a rich clean boost. The Gold Label Overdrive is not for everybody. This luxurious overdrive was designed for players with exacting tastes in equipment by playing to the strengths of the ‘beauty in simplicity’ of vintage amps and modern recreations of those timeless designs. The Gold Label Overdrives touch sensitivity will astound you as the subtleties of your technique are audible like never before. As a tone seeker, you understand the significance of your overdrive running on 18 volts. The Gold Label operates on a 9 volt power supply, with an internal voltage converter converting that 9 into 18 volts. 18 volts provides more balanced power and head room which allows for a unwavering, full-spectrum reproduction of your guitars pure signal. The Gold Label Overdrive creates huge tone by fusing its distortion with your clean signal. The Drive knob controls this functionality by adjusting the amount of gain and the mix of clean signal. With the drive set low the Gold Label Overdrive acts as a gorgeous clean boost. The Gold Label Overdrive will be the last overdrive pedal you’ll ever need to invest in. CLICK HERE to buy the Gold Label Overdrive from Pro Tone Pedals.